I want to sincerely thank all the citizens of Harris County who put their faith in my campaign for judge and voted for me. I am truly humbled by the support shown in my quest to become the next Judge of Harris County Criminal Court at Law No. 13. I especially want to thank my beautiful wife, Pati Limón de Rodríguez, who without her love, support, enthusiasm and dedication to this campaign, my success would never have been possible. I also want to thank my family and friends who believed in me. Thank you to every person who signed my petition and to each person who contributed money to my campaign. I also extend my gratitude to each person who liked or shared my posts, to the precinct chairs who block walked, to the volunteers who phone banked and to the staff at the Harris County Democratic Party. To the Houston Chronicle, legal bar associations, Democratic clubs and community organizations that endorsed my campaign, I thank you. To my fellow Democratic candidates who won their primary election, congratulations. To my colleagues who were unsuccessful in their respective races, stand tall and proud knowing that you gave it your best. Now, we move on to the General Election in November, where I will be asking each and every one of you again for your support. 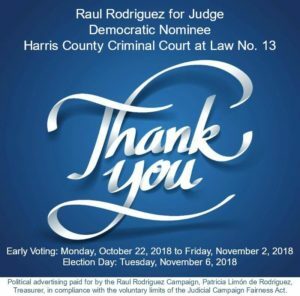 Political advertising paid for by the Raul Rodríguez Campaign, Patricia Limón Rodríguez, Treasurer, in compliance with the voluntary limits of the Judicial Campaign Fairness Act. Copyright 2017. All Rights Reserved. Political advertising paid for by the Raul Rodríguez Campaign, Patricia Limón de Rodríguez, Treasurer, in compliance with the voluntary limits of the Judicial Campaign Fairness Act.